Here is another map we have featured in our 'Mapping Manchester' exhibition in the Rylands Library. It is a nice example of transport mapping displayed in 'Car and the City' cabinet that focuses on surveys and plans of car travel and new road schemes. The daily flow of vehicle traffic on major routes into Manchester is dramatised here as black arterials that converge on the city centre, nearly obliterating places unlucky enough to be underneath. The map indicates in a powerful fashion that traffic volumes were overwhelming current capacity. The rapid expansion of car ownership since the 1950s has had a profound effect on Manchester. New routes have cut across the city and many roads have been widened and reconfigured. 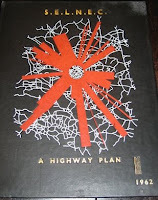 The planners responsible for these new highways have relied on a multitude of maps and models. The map displayed here is the triumphal product of the South-East Lancashire and North-East Cheshire Area Highway Engineering Committee. 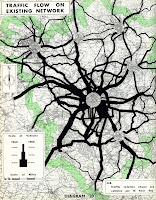 The flagship representation of their 1962 Highway Plan set forth the need for numerous road building schemes deemed essential once funds became available. It symbolises the hopes of the early 1960s that visionary planning could, through scientific analysis, improve the functioning of roads and thus the efficiency of the city region. Much of this grand vision was never realised, although some key aspects of the inner and outer ring roads have come to pass, albeit in a the piecemeal fashion. What has become the M60 orbital motorway took until 2000 to realise. Our edited book is finally out in print. Its taken a while as it started life as a session at the RGS-IBG conference in August 2006. The book contains 12 original chapters. Unfortunately, it is only published in hardback and is tad expensive. 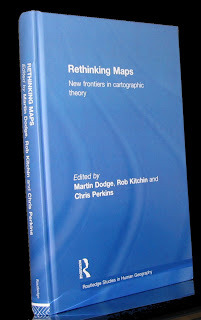 Also, the cover is rather bland; Routledge would not use our nice design idea of a blank map. Page proof versions of chapters 1 and 12 can also be read online. The theme issue I have been co-editing with Chris Perkins is now officially published in Geoforum. There are five papers and a fairly lengthy introductory essay from us. Over the next few weeks I will post scans of some of the maps and plans we have featured in our 'Mapping Manchester' exhibition in the Rylands Library. To start with 'Wealth and Poverty' cabinet that focused on surveys and plans of housing conditions and new development schemes. Manchester’s burst of population growth in the first half of the nineteenth century brought with it severe housing problems. By the 1840s the ‘Shock City’ became notorious for its slums. From the mid-nineteenth century private estates of substantial suburban villas were constructed, away from the poverty and crime of the inner neighbourhoods, for the affluent beneficiaries of Manchester’s industrial prosperity. 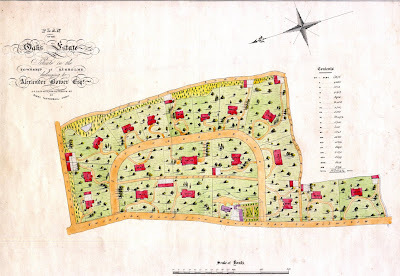 An example of these developments can be seen in the sales map for the Oaks Estate, planned in 1843 (shown above). In its bucolic design, individual houses are arranged in their own wooded grounds with curving driveways. The area of Oaks Estate is now occupied by the, not quite so elite, Owens Park student halls of residence of the University of Manchester!